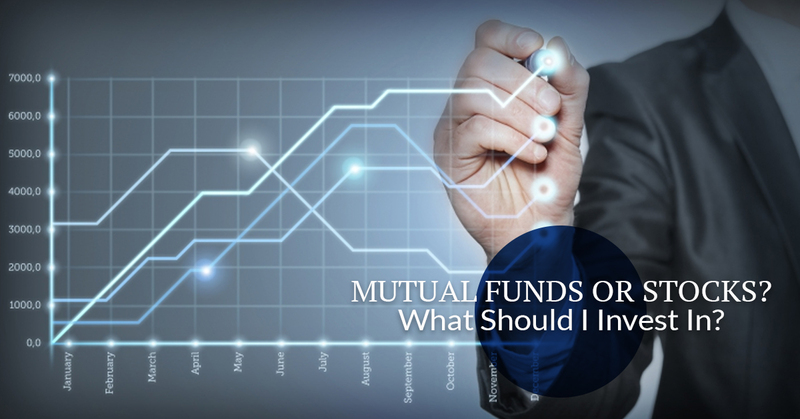 When it comes to investing, “Should I invest in mutual funds or stocks?” is a question that you want to have answered well before you put money down. In fact, there are a couple of major factors that can make it generally easy for you to decide what investment opportunity is best tailored to benefit your portfolio. At P.A. Ber retirement Solutions, we have been helping people of the greater-Chicago area answer questions like “Mutual funds or stocks?” for years — because an investment is only as good as the investor is informed. 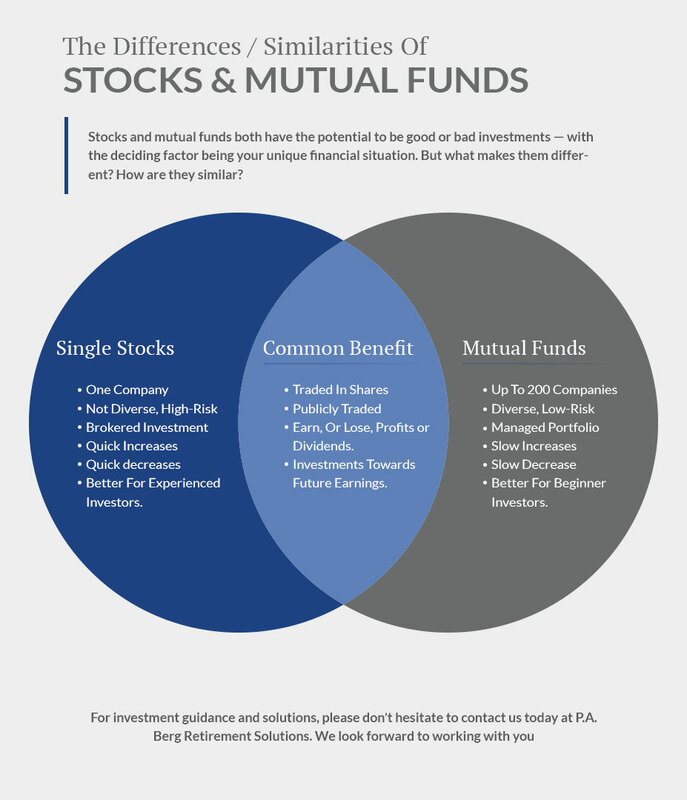 In today’s blog post, we will be discussing the difference between mutual funds and stocks, and how you might know which investment strategy will benefit you most. Mutual funds and stocks are both excellent investment opportunities for those who are planning for retirement. That being said, depending on your unique financial situation, one might be better for you than the other. Below, we have outlined some of the most noteworthy aspects of each investment strategy. If you are investing in stocks, you are investing directly into the company that you buy them from — making you a minority shareholder in the company. In doing so, there are two ways that you are able to make money — one, being that they can generate dividends that pay our quarterly, and two, you can sell them. Stocks are continuously traded, causing the market and the stock’s success to fluctuate, but a benefit of investing in stocks is that you can get out at any time by selling. A mutual fund is a stock in a stock fund or bonds in a bond fund. Like individual stocks, you would own a share of the mutual fund once you invest. The price of each share is known as a net asset value and is determined by the value of all its securities divided by the number of shareholders to the fund. Funds can be exchange-traded or managed, providing flexibility and choice for investors. Mutual funds are often best known for their ability to allow investors to choose the industry or location that they are investing in. To put it simply, stocks are much riskier than mutual funds and should only be bought and traded by experienced investors. Why? Well, when a number of stocks are pooled in a stock fund, or when bonds are pooled in bond funds, they become much less-risky — because if a company is poorly managed or is performing poorly, the companies losses are balanced out by the other investments in the pool. You might be thinking “Then why would I invest in stocks?” While yes, the stocks can be volatile, stock investments grow and increase much faster than mutual funds. So What Do I Need to Know Before Investing? The simple fact of the matter is that mutual funds are safer for inexperienced investors and stocks are better for experienced investors — but that does not limit your investment opportunities, it simply limits how the opportunities should be approached. If you plan on investing on your own, it might be beneficial for you to make a low-risk investment in mutual funds like stock funds or bond funds. If you plan on investing in stocks, you should either be experienced in trading or work with a certified financial planner or investment advisor. At P.A. Berg Retirement Solutions, we know a thing or two about financial planning and the investment opportunities that might benefit someone that is planning for retirement. Whether you are a beginner that is considering investing in mutual funds or an experienced investor that needs a second opinion about an aggressive investment strategy, our team of registered investment advisors is here to help you plan for a comfortable and financially stable retirement. Our team is experienced and motivated to help you with all of your financial planning questions and needs. Contact us today to get a free evaluation or to schedule an appointment. We look forward to working with you towards a stable financial future. Are you interested in growing your investment and retirement planning knowledge-base? Take a look at some of our most recent newsletter posts.